It's funny – I've always hated this movie. I actually saw it when it first came out. I didn't know what the word 'campy' meant then, but the portrayal of the characters and setting was just a bit too cartoonish for me at the time. I remember thinking that the first one was serious, while the second one was just a joke. But I've recently re-watched both Tim Burton Batman movies, and it turns out they're both equally campy; in their own, dark way, they're actually no less campy than the Adam West version. It also turns out I've been wrong about Batman Returns for my entire life. Granted, this isn't the Batman geeks like myself have come to embrace. This Batman lacks the comic version's flat out moral refusal to kill. In fact, he incinerates one goon and shoves dynamite down the pants of a second (and then has the audacity to lecture Catwoman about killing later: the hypocrite). But this does a fantastic job exploring the concept of the double life. The party towards the end where Bruce and Selina enter as the only two ostensibly not wearing masks isn't exactly subtle, but it is extremely effective. And, while the first two thirds of the movie are pure camp, the finale feels more operatic. It's dramatic and over-the-top, but still somehow genuine. The Christmas elements are, on some level, a bit tacked on. The holiday connections don't really have much impact on the plot or even the tone (as they did in Die Hard), but they permeate the film enough to justify its inclusion here. Oddly enough, they didn't get the movie a winter release: the studio, greedy for the larger potential profits associated with the summer, originally released this in June. It's always a pleasant surprise to discover a movie you've always dismissed is actually a lot better than you ever gave it credit for. 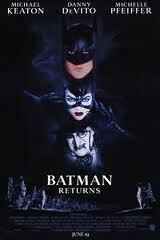 You can pick up Batman Returns on Amazon, or even stream it there pretty cheap. I always loved this one. I think it's Michelle Pfeiffer that did it for me. MMM...Catwoman...Leather...yep that's it. Live-Tweeting the Macy's Thanksgiving Parade!